Tourism Kelowna is proud to partner with the Wines of British Columbia, Quails&apos; Gate Estate Winery, and the Thompson Okanagan Tourism Association (TOTA) on a marketing initiative to profile Kelowna and the Okanagan Valley&apos;s amazing culinary bounty to highly motivated wine and food lovers in the Western United States. 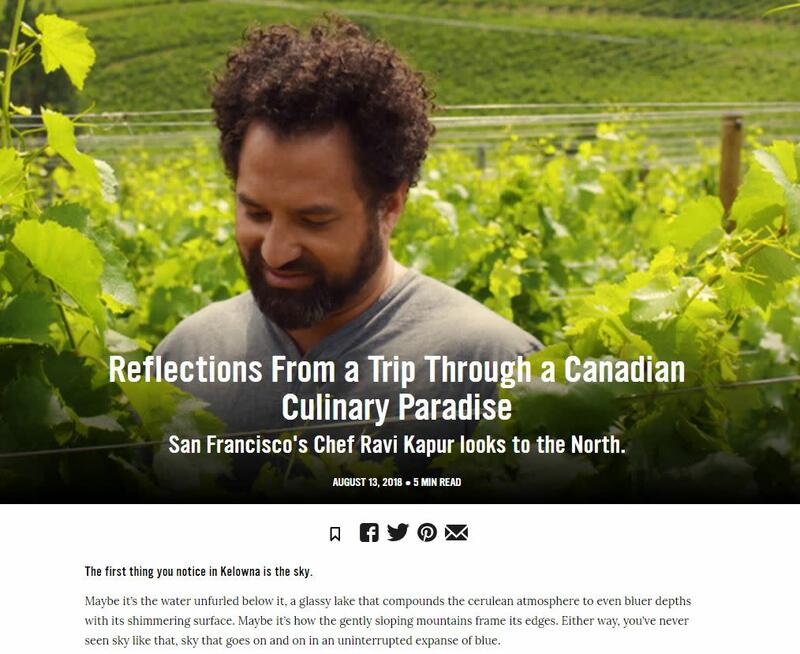 In late June, award-winning, San Francisco-based chef, Ravi Kapur, of Liholiho Yacht Club, came to Kelowna to experience Okanagan wines and ingredients for himself. Chef Kapur brought a video team from ChefsFeed along for the trip to document and share it with travellers hungry for new adventures. His three-day adventure had him staying in comfort and style at the lakeside accommodations at Quails&apos; Gate Estate Winery, taking in the Wines of British Columbia&apos;s Chef Meets BC Grape Okanagan event, participating in remarkable Kelowna experiences, and sharing meals with local wine and food experts. His adventures took him to the lake with Downtown Marina, along the fragrant paths at the Okanagan Lavender and Herb Farm, among the vines at Quails&apos; Gate Estate Winery, through buzzing Downtown Kelowna, into the orchards at Paynter&apos;s Fruit Market, and through the cellars at Mission Hill Family Estate. While here, Chef Kapur shared local meals with Chef Roger Sleiman at Old Vines Restaurant, Chef Andrea Callan at Red Fox Club, and Chef Rod Butters at Sunny&apos;s, and took in a hike with Aman Dosanj of The Paisley Notebook. 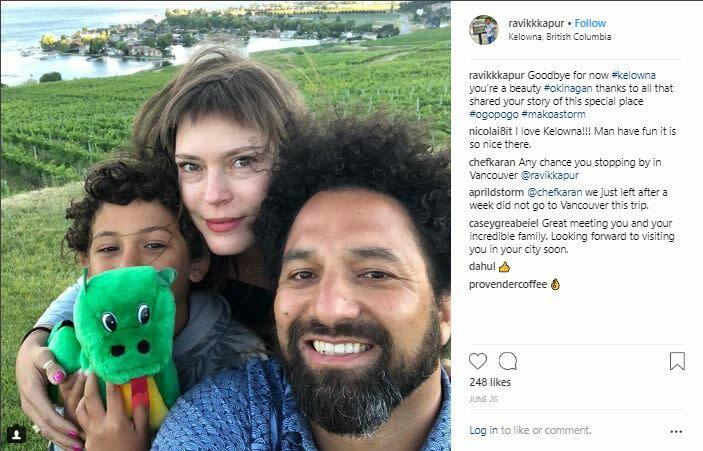 Watch the video of his adventure through Canada&apos;s culinary paradise: Kelowna and the Okanagan Valley, and read the article about his time here. This campaign is supported by Destination Canada&apos;s Connecting America program to inspire U.S. travellers to visit Canada. The campaign includes video, editorial, social media, e-mail marketing, and digital marketing tactics targeted at food and wine lovers in and around San Francisco, Seattle, and nearby communities. We had a great time introducing Chef Kapur to our destination - and we think he and his family enjoyed their time here, too! 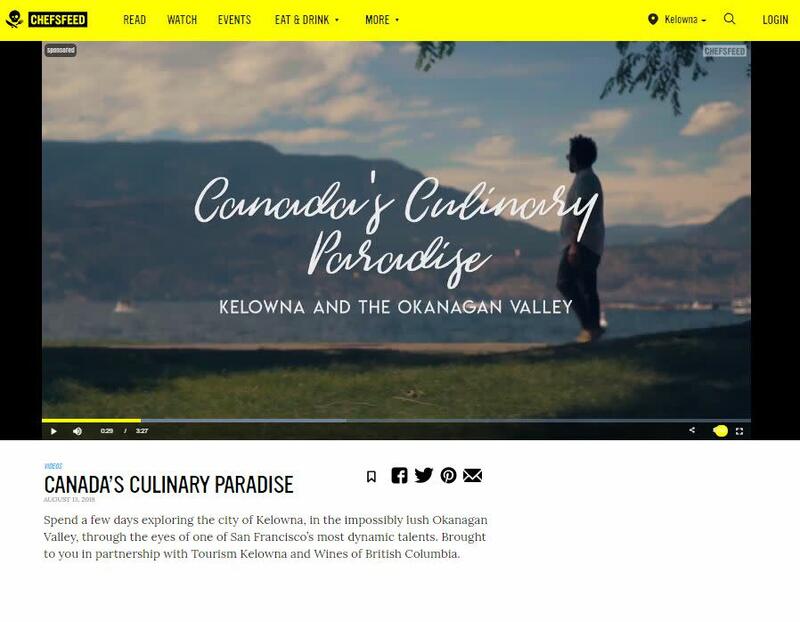 If you have any questions about Tourism Kelowna&apos;s marketing program and initiatives, please contact Chris Shauf at chris.shauf@tourismkelowna.com or by calling (250) 861-1515 ext 203.